PATOKA LAKE -- Join in the 12th annual Patoka Lake Clean Up on Saturday, August 25 at our new location at the Patoka Lake Dam. Participants of all ages and abilities can sign up on location at 8 am EDT and will be assigned an area to pick up trash and recycling along the shore. At 11 am, all volunteers return to the dam to be treated to a fish fry, music, door prizes, goody bags and of course, a free event t-shirt! 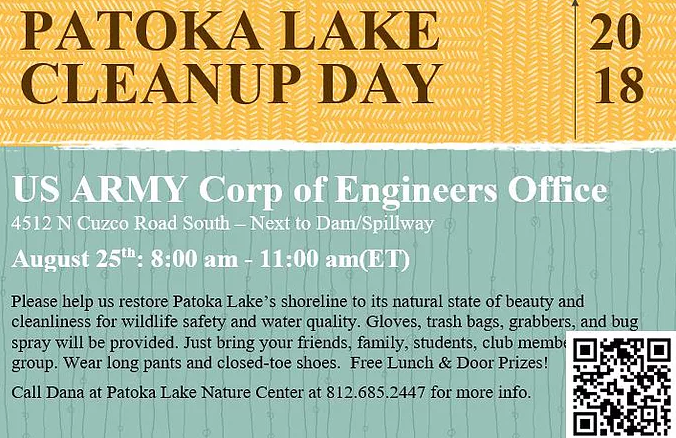 Join in the fun and help rid Patoka Lake Watershed of unsightly, unhealthy trash! Each year volunteers pick up over 2000 pounds of trash and recycling during this event. All supplies are provided; volunteers just need to show up! Volunteers should wear sturdy, closed-toe shoes and consider carpooling to the site. This year’s event will take place at the Patoka Lake Corps of Engineers office at the Patoka Lake Dam at 4512 N. Cuzco Road, Dubois. For information about the event, call the Patoka Lake Nature Center at 812-685-2447 or like the Patoka Lake Watershed Steering Committee Facebook page for updates.